India is the largest producer of milk in the world. Milk production in the country is increasing @ 4% per annum contributing more than Rupees one lakh crores to the GDP. There are over 700 milk processing plants in the country requiring large human resource pool to run these dairies. With the introduction of modern technology in the production and processing of dairy products, the concept of milk is shifting towards value added dairy business. The Dairy and Food Industries have opened up new avenues for employment and economy. It is estimated that Dairy industry is generating new jobs to the extent of one lakh every year. This sector is further expected to grow faster and generate more employment in the near future. Adoption of the latest and advanced technology in milk processing can provide better quality, nutrition and more employment opportunities. College of Dairy Science & Technology (CDST) is one of the renowned institutions for Dairy education in the country. 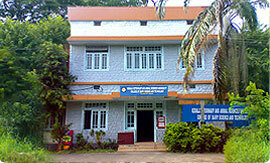 This is the only college in Kerala, offering a Four year professional B.Tech programme in Dairy Science & Technology. Dairy Technology offers a promising option for value addition and resource mobilization in terms of availability of dairy products for the consumers and simultaneously providing more earnings at farmers and industry level. There is immense scope for dairy industry to grow in view of the globalization and increasing purchasing power of consumers. This will boost up the requirement of Dairy Technologists and researchers in the country.